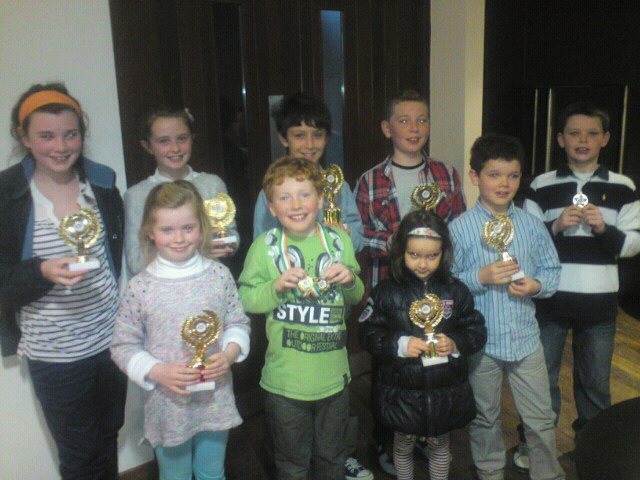 Students from the Ceallaigh School of Music, Manister, who enjoyed sucesss at the recent Feis in Ennis, Co. Clare. Back row l-r Julianne Barrington, Chloe Ryan, Cian Connolly, Jason Kelly. Cathal Barrington. Front row Aobhin Barrington, Andrew Kelly, Aoife Connolly, Frankie Barrington. The next car boot sale in aid of the Rockhill Bruree Sportsfield Development Committee will be held on Saturday, November 24th. Full details later. After a break of many years, badminton has resumed in Bruree Community Centre. Last week, a representative crowd attended a meeting to discuss the revival of the club and things have moved on from there. There has been huge interest over the first few nights of play. Play will continue on Monday and Wednesday nights from 9.00 to 11.00 pm. Anyone interested in playing is asked to come along and membership is not confined to the parish. Membership is only open to over 16s. Contact Francis Finn (087-6351506) for further information. Juvenile GAA Awards Night: Date for your diary! 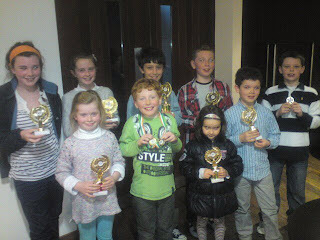 The Annual Juvenile awards night will be held at Bulgaden Castle on Sunday, 9th December, from 5.00 to 8.00 pm. Tickets are €10 for adults payable at the door. There is no charge for children and all children attending must be accompanied by an adult. This should be a great evening with lots of medals and awards to be distributed. Indoor Hurling: This is the fixture list for the remaining indoor hurling matches. Under 10/12s is on Thursday 15th November which is the Semi final play offs. Under 6/8 is on Monday 19th November which is also semi final playoffs. All under age matches remain at the same start time of 6.45 pm approx. The finals for all age groups are on the Thursday, 22nd November, and all indoor hurlers are to attend on this night as medals will be presented to all indoor teams. Trophies will be presented to 1st and 2nd place teams at the up coming Juvenile Social. This competition is once again kindly sponsored by Mr. Ray Moloney. Liam Lawton will perform in concert at Ballyagran Church on Friday, December 7th. This is a fundraiser for Ballyagran Camogie Club and tickets are available from club members. Players Development Fund: Bruree GAA is holding its Player Development Fund annual draw again this year. The 2012 draw has €4,500 in prizes over four weekly draws. And the good news is that the subscription is still the same - just €20 for the four draws. The first draw will be held on Monday, December 3rd, with the other draws on subsequent Monday nights. The prizes for each of the first three draws are 1st €500 2nd €200 and three prizes of €100. The Grand Prize in the final draw on Monday, December 24th is €1,000 with a second prize of €200 and three prizes of €100. To participate in the final draw the full subscription must have been paid. The club caters for a total of nineteen teams at underage and adult level and your continued support for the draw will ensure that the club can continue to provide for everyone in the parish who wishes to participate in our gaelic games. Contact any member of Bruree GAA to join the draw. AGM: The Annual General Meeting of Bruree GAA was held last week and attracted a large attendance. The meeting looked back at a busy 2012 and looked forward with anticipation to the coming year. The club played over fifty games at adult level during the year as well as organising training and fundraising activities. The senior hurlers fortunes improved this year and, but for circumstances outside their control, could have been involved in the playoff stages of the championship. They were narrowly defeated in the final of the county cup. The intermediate footballers were somewhat out of their depth at this level in spite of some good performances. The junior hurlers reached the quarter final of the south championship and great credit is due to the players for the great effort they put in during the year. Bruree competed at minor level for the first time in a number of years and put in some excellent performances. There were a number of very successful fundraising initiatives during the year including the golf classic, players draw, fun day, lotto, fun cycle, Mackey draw and the church gate collection. A sincere thanks is offered to everyone who supported and helped organise these events. The club also embraced new technology with a Facebook page being set up. The treasurers report showed the club to be in a sound financial position. The club would like to thank everyone involved with the club during 2012 and everyone who helped in any way with the running and financing of the club. Mackey Winner: Congratulations to James O’Dea who won €500 in the October Mackey Stand draw. James joined the draw with Bruree GAA. We extend our sincere sympathy to the family, relatives and friends of Maurice O’Connor, Garrienderk, and Myles Cunningham, Garryfine, who died recently. Beech Lodge Care Facility will remember residents who passed away over the last 12 months with a special mass on Friday, November 30th. The Mass of Remembrance will take place at 3.00 pm, celebrated by Fr McAuliffe. Former residents of Beech Lodge who passed away at the care facility or in another location such as hospital or their own home will all be remembered. Families and friends are welcome to attend. Lucky dip winners in the Bruree GAA/Rockhill Rovers lotto draw over the past two weeks were €50 June O’Malley, Charleville, Kieran, Mike and Shane Mullane €25 John Flaherty, Michael Mooney, Gerard Flaherty, Kay Cagney €20 Ann Corkery, mike McGrath, Jack Murphy, Rosie Lynch, Pat O’Riordan, Meanus, Maurice Conway.